Originally posted in January of 2013, Jim Vicevich asked me to repost this today. Minor edits have been made. Please read and share this post via social media. A firearm can be an appropriate part of a complete home-defense plan, but it should not be the only plan. Motion activated exterior lights, locking your doors and windows, an alarm system, and a barking dog (if appropriate) are important. Your plan should include where you will go and where your family members will go if someone breaks in. Call for help and take a defensive approach where you – and your firearm if you have one – are between the intruder or intruders and your family. This may be difficult in some home designs, but you need to figure it out. I personally do not think you should “clear” your house if you have, or strongly suspect, an intruder. Many law enforcement officers I know will not clear their home by themselves. Why a semi-automatic rifle a good choice for home defense. Here is a list of valid reasons, in no particular order. 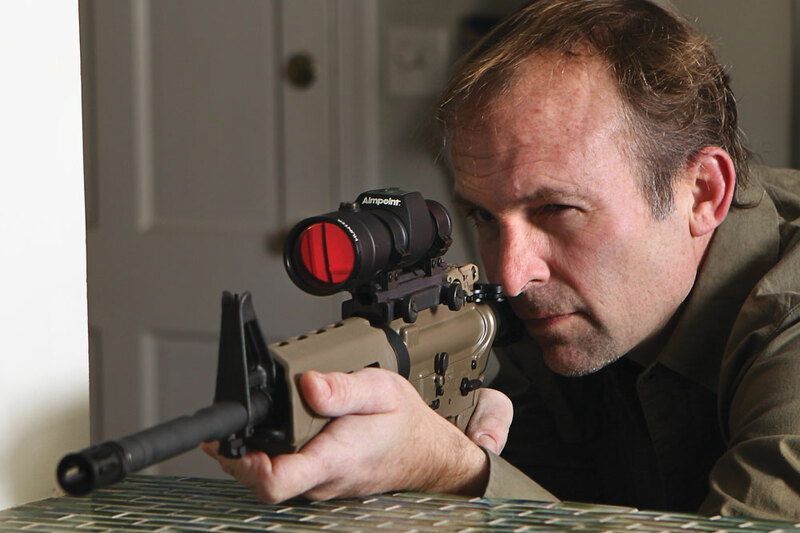 You can mount a light, red dot sight and/or a laser to the rifle to make it easier to used and aim during the day or night. The .223/5.56 self-defense round is appropriate for use within a home, even in an urban environment. Ballistic experts have found rounds from these calibers “dump energy” quickly and break apart or begin to tumble after penetrating the first barrier. Will rifle rounds go through walls? You bet. Will pistol calibers like 9mm, .40 and .45 go through walls? You bet. Will shotgun rounds go through walls? You bet. That said, there is significant evidence the .223/5.56 self-defense rounds penetrate no more than, and often less than traditional handgun calibers and many shotgun rounds. In a self-defense situation, you want to avoid manipulating the firearm at all except for pulling the trigger straight back. Law enforcement and civilians do not favor high-capacity magazines so they can shoot more rounds, they favor them so they can manipulate their gun less. If reloading is needed, it is possible but let’s be completely honest, in many self defense situations, ten rounds may not be enough. For a more detailed review, check out this post.